As a good parent and an ambassador of the Soundtrack of my own life, I made several CD’s for our children with songs from my own youth. Most of them I only heard as a grown up, when I began collecting this stuff. 90% of the records, that were made for children in the 60’s and 70’s, are complete crap, but there are a few really great records made in that period. My children were not impressed by the two CD compilations that I made, but they are very popular among my friends. 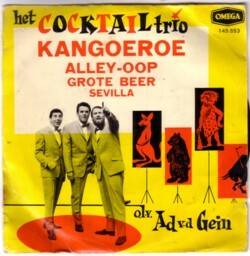 On these compilations I put several songs made in the 60’s by a Dutch band called Het Cocktail Trio. They were extremely popular in Holland in the 60’s and 70’s. They were regular guests in every possible radio and television show and had a long list of hit records. For copyright reasons their compilation LP’s missed some of their best material, so I tried to collect their original 45’s. 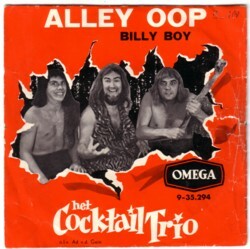 Today you rarely hear their music anymore, and they are not very popular among my record collecting friends. But I think they were a great band and I am still hoping that there will be a DVD made with some highlights of their many TV appearances. Or maybe even a complete live show, if such a registration was ever made. They made many covers of novelty hits from other countries, but with their own texts, that usually had little to do with the original texts. Still, I like the songs. As a child I only knew a handful of their records, so I was surprised to discover that they had made so much more records. And so much better ones too! 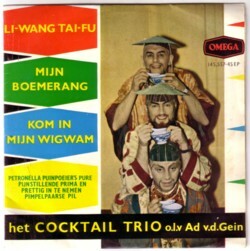 Het Cocktail Trio consisted of pianist, Ad van der Gein, a bass player, Carel Alberts, and a guitarist, Tonny More. I don’t think they considered themselves a brilliant musicians, but more like craftsmen, doing their job as good as possible. And their job was first of all entertaining their audience. Ad van der Gein is the only survivor and still playing. 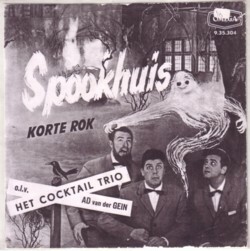 Here is one of these songs, a cover of a Sam Cooke hit, called Het Spookhuis .